Petitioning MSD Animal Health Stop the testing and killing of puppies, kittens and other young animals BORN TO DIE in a UK laboratory A BUAV investigation has uncovered the shocking use of very young animals, including puppies and kittens by MSD Animal Health in the UK in experiments for animal vaccines. The animals were killed and their bodies cut up for examination. During our 8 month investigation, 92 beagle puppies, 10 adult nursing female beagles, at least 15 kittens and an unknown number of rabbits, calves and chickens were killed by MSD Animal Health in one UK laboratory. Some of the animals, including rabbits, calves and kittens, were allowed to suffer the full extent of the symptoms of serious and even deadly diseases. A number of rabbits had to be killed due to the severity of their suffering. Kittens were used in experiments that caused them to suffer weight loss, high temperatures and ulcers. Then at less than 6 months old, the kittens were killed, their bodies dissected and dumped in a bin as waste. Pregnant beagles were delivered to the laboratory. After giving birth, they were allowed to remain with their puppies for just a few weeks. Most had their puppies cruelly taken away to be used in tests when they were only around 5 weeks old. Once their puppies had been removed, the nursing mothers were killed, sometimes within minutes. These trusting dogs were seen as nothing more than breeding machines to provide puppies to be used in experiments. The company had no system for finding homes for them; most were simply discarded. 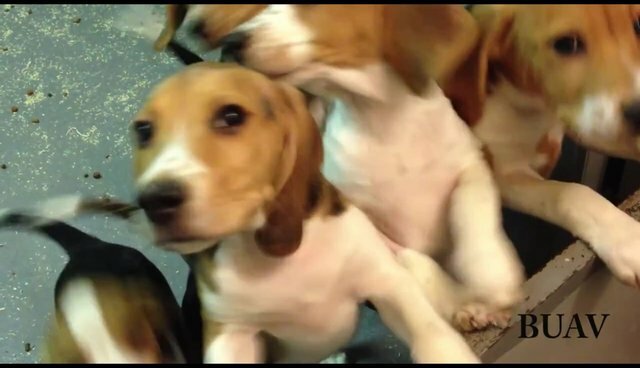 Some of the puppies could also have been released but shockingly this rarely happened because it was easier for the laboratory to kill them. Many of the puppies were used in tests and then killed; some at just 6 weeks of age. Restrained and given a lethal injection, their small bodies cut open and bits of organs sliced up and taken away for analysis.